Don't miss "The Skinny on Obesity (Ep. 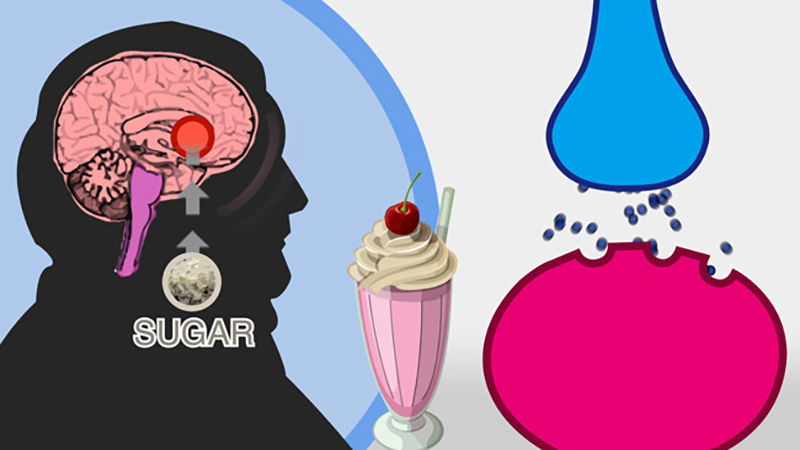 4): Sugar - A Sweet Addiction"
The latest episode in UCTV Prime’s “Skinny on Obesity” series is all about the science of sugar addiction and, if you’re anything like those of us working on the series, it’ll probably cause you to think twice when you instinctively reach for that afternoon snack. In jest, we call someone who loves and eats a lot of chocolate a “chocoholic.” But what if that could actually be true? What if we could be addicted to food much like alcohol or drugs? Currently in the scientific community, there’s growing support for the concept of “food addiction.” Highly palatable foods activate the “reward circuitry” in the area of the brain that makes us experience pleasure. It appears that certain people, primarily those with obesity, may have less — not more — of that pleasure response from eating, and that may induce an overwhelmingly strong biological drive to eat more. It’s easy to believe that it’s simply a lack of willpower, but that is not a helpful or accurate description of the phenomena. Food addiction is associated with a compulsive and obsessive relationship with food. People with this condition may binge eat, but that is not a necessary part of the condition. They may feel out of control and will often eat past their point of fullness. Food addicts can be any size and any age, but we largely see this disorder in the overweight to the obese. Research suggests that the largest difference between “food addicts” and “non-food addicts” is that palatable food cues are more powerful (e.g., able to trigger cravings, enhanced motivation to seek out food, etc.) for food addicts. This is very similar to what we see in other addictions. Take this quiz to see if you might be addicted to food—but know that this does not provide a diagnosis. Rather, the quiz can give you an idea of whether or not you score high on this food scale. If you do, you might want to seek treatment from a professional therapist with experience in this area. Resources are listed below. The following questions ask about your eating habits in the past year. People sometimes have difficulty controlling their intake of certain foods such as sweets, starches, salty snacks, fatty foods, sugary drinks, and others. When answering these questions, please keep these certain foods in mind. I kept consuming the same types or amounts of food despite significant emotional and/or physical problems related to my eating. Eating the same amount of food does not reduce negative emotions or increase pleasurable feelings the way it used to. I find myself consuming certain foods even though I am no longer hungry. I worry about cutting down on certain foods. I feel sluggish or fatigued from overeating. I have spent time dealing with negative feelings from overeating certain foods, instead of spending time in important activities such as time with family, friends, work, or recreation. According to Yale University’s Ashley Gearhardt, who developed the scale, research suggests that if you answered 3 or 4 to three or more questions, it is suggestive of eating problems that might need professional help. Here are some resources if you find yourself in that category. Crave: Why You Binge Eat and How to Stop, by Cynthia M. Bulik, Ph.D.
Couldn’t obesity stem from our body’s inability to digest and assimilate modern processed foods? We are bombarded by these dangerous consumables and most of us have never experienced “real” food. Where can one obtain free-range meat, raw dairy products and organic fruits and vegetables these days?! It seems like we are cornered by the food industry. The sad part is, this diet is killing us and we are doing it to ourselves and to our own children. You can call it addiction, but these habits are formed by convenience and the lack of an affordable and available alternative. We all know it’s killing us, but we are all hungry and need to eat. I just read a great quote that pretty much sums up the obesity epidemic: “Eating poor-quality foods that don’t fit our evolutionary needs triggers your body to release inflammatory messages that prevent critical parts of your metabolic system from working, thus crippling your metabolism and causing you to gain weight.” Mark Hyman, M.D. Thanks. I just finished reading “Nourishing Traditions” by Sally Fallon. Wonderful book. I have looked into Weston Price, in regards to raw milk. It seems as though all the “real” food is illegal where I live. this sounds ridicously simplistic although i wont critise the idea until i read where the qoute came from. please provide a citation for your source. Raw milk may have advantages but it is not homogenized milk that is causing food addiction. Neither are non-organic foods, though organic may have other advantages. Keep things in perspective, people! Unlike addictive substances such as alcohol and drugs, you don’t have to completely cut out all processed food at one time. In fact, cutting out a food type is associated with a pendulum swing and weight GAIN later. Very few people who have maintained significant weight loss are now vegetarian, vegan, or low carb eaters. Slowly increasing the ratio of unprocessed to processed foods, working on the stress-inducing thinking patterns, teaching problem-solving techniques, and encouraging individuals to get more involved in alternative activities can turn around addiction. It may take professional help in one or all of the areas. Suboxone Addiction Dot Org welcomes you to place comemnts on the topic of Suboxone, Suboxone addiction, and other related drugs and drug issues. We look forward to your comemnts. Question from the video: it takes 3 weeks to reduce the quantity of dopamine receptors. If someone exerts a huge amount of willpower and stops eating hyperpalatable foods altogether, how long does it take for them to develop new dopamine receptors so they’re back to normal? Is it 3 weeks, or does it take longer? Is this still an unknown? Thanks for reading. I’ve been getting discovering for some time for any great content articles in this kind of house. Seeking in Bing I finally stumbled upon this site. Looking over this information So i am pleased to exhibit that I’ve a very good uncanny feeling I discovered just what I needed. I most unquestionably will make certain to don’t put out of your head this web site and make a look on a continuing basis. I find all this information very interesting and I can relate to a lot of it. I am a sugar addict without doubt! I have tried going back to basics before but failed miserably as I crave the sugar too much. Knowing the science behind it all will really help me personally, I have no doubt, however, it seems to me that what we can actually eat is very limited. This is a concern for me as I don’t want boredom to become a barrier…..food ideas for interesting high fibre low sugar meals would help. Should I look up diets that are suitable for diabetics?? Also I can see now that I do not eat anywhere near enough fibre day to day so I am hoping that by increasing my fibre intake my sugar cravings will reduce. Are there any cold drinks out there other than water that I can drink that aren’t too damaging? Is there anything that can be done to counter the effects of drinking alcohol too? It feels like I’m about to go cold turkey on a number of things just by putting my faith in increasing fibre intake…….not sure if this will work for me although I do not doubt the science at all! ?